Change is in the air as the island state rethinks its approach to education. Singapore has long been an educational high-achiever, endorsing rote learning and long study hours to propel school children toward exam success. But change is in the air as the island state rethinks its approach to education. Discussions, homework and quizzes are set to replace marks and grades as the preferred method of collecting information on the performance of young primary school pupils. Starting in 2019, exams for primary years 1 and 2 students will be abolished. Older primary and secondary students will also study in a less competitive environment. Marks for each subject will be rounded off to the nearest whole number — without decimal places — to lower the emphasis on academic success. “Learning is not a competition,” states Ong Ye Kung, Singapore’s Education Minister. The Ministry of Education (MOE) is planning a series of changes aimed at discouraging comparisons between student performance and encourage individuals to concentrate on their own learning development. To this end, primary and secondary school report books will no longer indicate whether a pupil finishes top or bottom of the class, while subject and group averages, overall total marks and minimum and maximum grades are set to disappear. School reports will not show underlined or highlighted failing grades or record a pass or fail result at the end of year. Singapore’s new approach to education is in stark contrast to the neighbouring states that crowd the OECD Programme for International Student Assessment (PISA) education rankings. 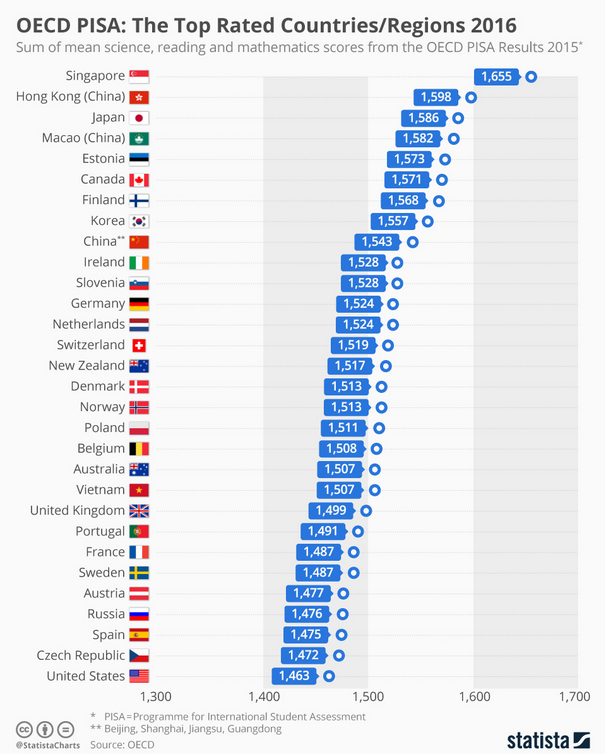 Every three years, the OECD assesses worldwide education systems by testing the comparative science, reading and mathematics proficiency of 15-year-old students. Singapore set the standard for exam success by achieving a mean score of 1,655 in the three core subjects tested by PISA’s 2-hour exam in 2016. The top four places are dominated by Asia Pacific education systems, with Hong Kong, Japan and Macau demonstrating strong exam performance. By comparison the UK occupied 22nd place in the ranking, while the US ranked 30th, scoring 1,463, which is below the average score of 1,476. Shifting the focus away from exam perfection towards creating more rounded individuals represents a serious change of direction for Singapore. Alongside academic performance the new policies aim to foster social development among pupils to raise self awareness and build decision-making skills. Classroom behaviour and practice is being brought in line with local workplace needs as the island state prepares pupils to work in its growing service sector. A series of “applied learning” programmes are scheduled to be in place by 2023, to bolster personal development and help students acquire real-world skills. The programmes allow school children to dip into expressive topics like drama and sport, as well as more industry-focussed areas like computers, robotics and electronics. The Ministry of Education has assigned a team of career-guidance officials to change existing perceptions and push student aspirations beyond working in banking, civil service and medicine. Adapting student attitudes may prove an easier challenge than changing the outlook of Singapore’s parents, who grew up with the stresses and rigours of examinations. Resistance to change could represent good news for the island’s private tutors. One thing that hasn’t changed is the primary school leaving certificate. Taken at age 11 or 12, this stressful make-or-break exam has traditionally served as a route to a high level government career. There are no plans to change this aspect of the island’s education system. The skills we need to perform at work are changing - and quickly. 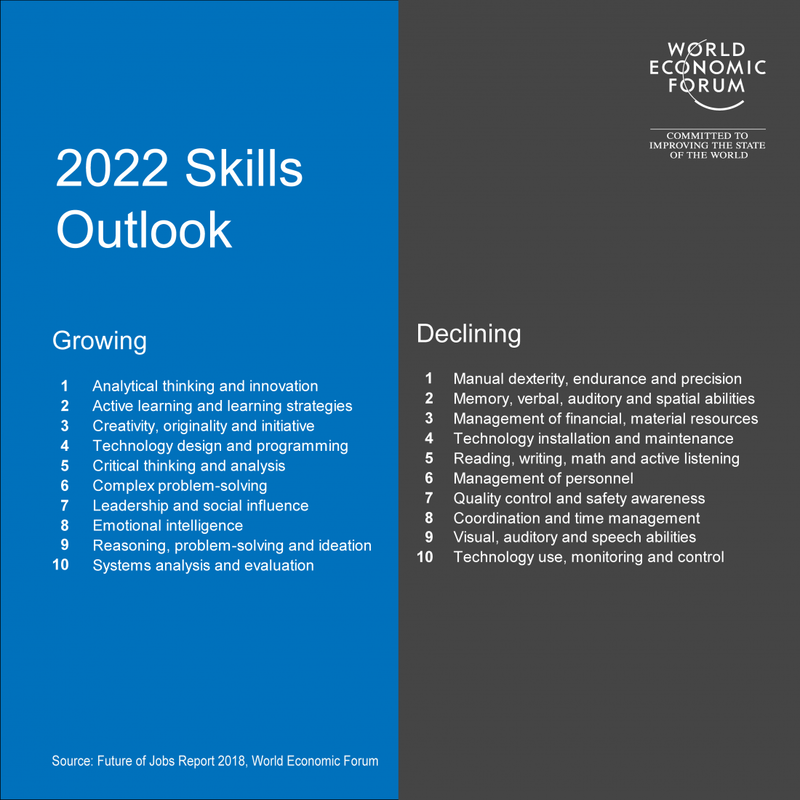 The World Economic Forum's Future of Jobs Report 2018 suggests that employees will see an average shift of 42% in workplace skills between now and 2022. Human-focused or soft skills like critical thinking, leadership and complex problem-solving will become increasingly important. The report warns that to keep up we'll all have to become lifelong learners - with employees needing 101 days training or upskilling by 2022. Economies like Singapore are adapting their education systems to keep up with these changes. We'll have to wait to see who comes out top of the class in the future world of work.